Summary: A productive week, despite losing 2 days to the Thai New Year celebrations. 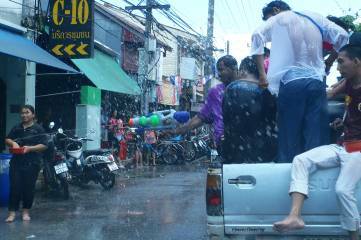 Friday is Thai New Year (Sonkram) so nothing happens Friday or Saturday except spraying people with water and other forms of celebration. At the helm, Max got the whole helm area foamed in, which involved 5 complicated bits of foam. He used the existing inner layer of fiberglass as a form, but it was so flimsy that it needed significant reinforcing before he could stick foam to it. Jon then de‑cored the area where the steering gearbox bolts on, cutting away the foam so it can be filled with epoxy mud. 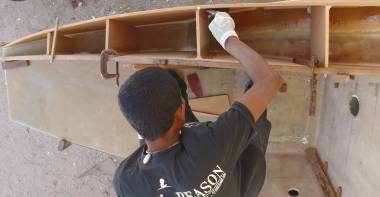 Max also cut out a section of bad balsa from the long wall between the galley and the battery compartment. 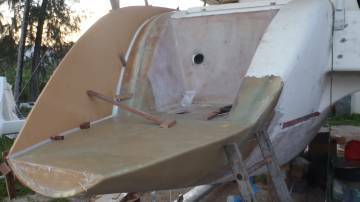 At the sterns, the starboard transom extension was glassed in to match the port side. Then work started on the outer walls coming down to the new swim platforms. The inner and outer skins of both walls were built and epoxied down, as well as 5 internal strengthening webs. On Friday, Golf and his wife took Sue on a tour of the Sonkram celebrations and then took her to a sumptuous lunch - Jon would have loved to go as well, but he was feeling ill that day. Bit of a strange day today. It didn't feel like we did very much, and not much happened until after lunch, but by the end of the day we'd accomplished a lot. It's coming up to Thai New Year (Songkran) which will last much of this week. Apparently this is a time when the Buddha statues are taken out and cleaned before being paraded through the streets. Traditionally, the water used to clean the Buddhas was then poured gently over the people, but now the whole thing has turned into people squirting water at anyone within range. More on that later -- Friday April 13th is the big water day here in Phuket. Some of Golf's workers have left Ao Chalong for homes up country. Many businesses will close as well, so Golf has pre‑bought some supplies to make sure we don't run out. This morning we picked up several more sheets of foam. We've told Golf that our workers are free to take time off to celebrate if they want to, but he's said that most would prefer to work (and get paid). Up in the cockpit, Max epoxied a sheet of foam onto the front of our helm area. This was a tricky job because the existing fiberglass was so weak and flimsy that we couldn't press against it to make sure the foam was well adhered to the underlying glass. 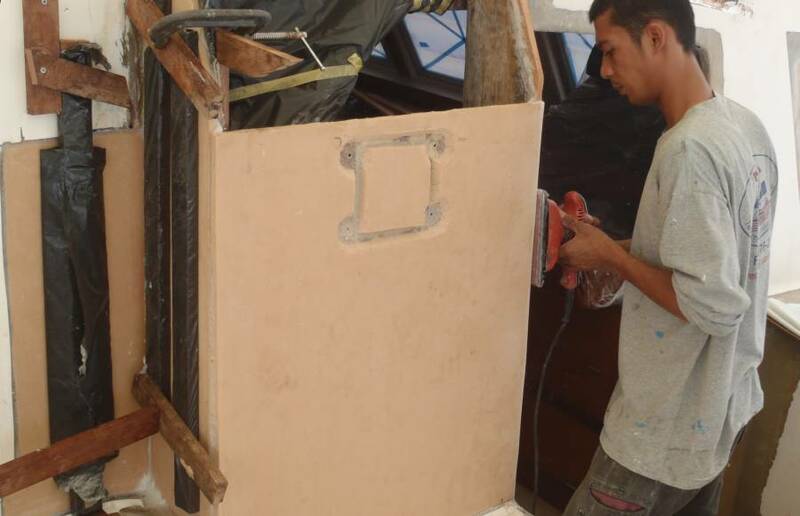 Max built a creative frame behind the fiberglass to support everything rigidly. 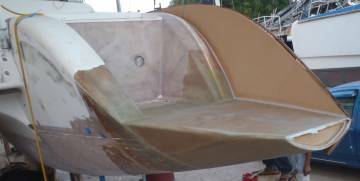 Then he laid a sheet of biaxial glass over the old fiberglass, smeared some epoxy mud on the foam, and pressed the foam onto the glass. To hold the foam to the glass, he could clamp the top, but the middle and bottom required more creativity. What Max eventually came up with had a certain Rube Goldberg appearance, but it worked! Up in front of our salon, we decided to cut open one of the compartments in front of our hatches, the ones with the (previously undiscovered) tanks in them. The compartments aren't very big but they have some usable storage space. It looks like we'll be able to put in a small hatch if we want. Golf is still thinking about how to repair this area, as it's a bit complex. 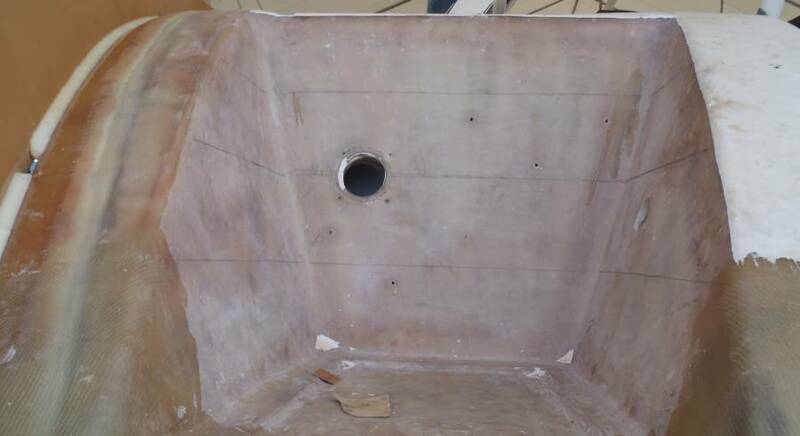 We'd glassed in the port transom extension late last week but starboard was still bare foam in places, as Houa was fitting the side wall there. 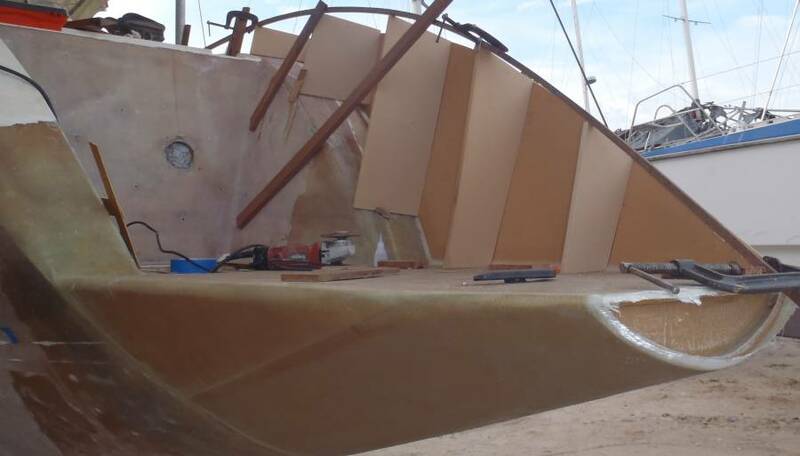 So today they took off some of the wood Houa was using to fit the foam so they could wrap the starboard extension in 3 layers of biaxial glass. 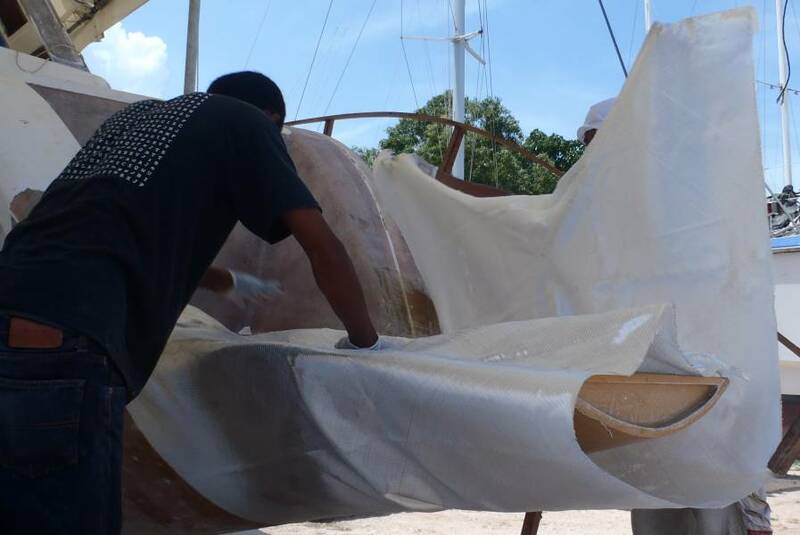 Just as they were finishing, a dark cloud came over and started dribbling rain at us, so there was a mad dash to get the wet fiberglass covered with plastic and get everything else under cover. In the end we only got 2 drips and a drop. Most of the rest of the team was working on the wall going out to our port extension. This is just a sheet of foam with one layer of biaxial glass on one side, but it's shaped to fit the complex curves needed to make it look like an original part of Ocelot. We spent a lot of time with Golf playing with exact positioning of this wall. We don't want it sticking out further than Ocelot's hull, especially up at the top. Once we got it just where we wanted it, Lek mixed up some epoxy mud and put a nice fillet in the corners to lock the wall in place. Then, even though it was getting on towards nominal quitting time, the guys setup the wall for the starboard extension. The glass they'd wrapped around the starboard extension was still a bit chewy, but it was tack free so they could work there. Since they'd just adjusted port side, they knew what was needed for starboard, so they soon had it positioned correctly. Then they mixed up some more epoxy mud and glued the starboard wall in position! So the score for today is: main wall under the helm foamed, starboard extension glassed, and BOTH outside skins of the outer side walls epoxied in place. Not bad at all! Today was more of a "preparation" day after all of the accomplishments of yesterday. The guys took most of the wooden forms off of Ocelot's flanks so we could see the shape of the new foam walls and how the new walls would flow into Ocelot's current lines. The two sides aren't quite the same, but Golf assures us that the discrepancies are easy to fix. The corner from Ocelot's hull to the deck makes quite a rounded bend, which should be interesting for Golf to match. Square corners are much easier. 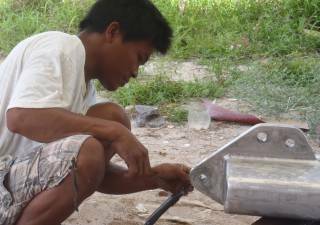 Several of our workers have gone home to visit their families for the upcoming Thai New Year, so things are a bit slow in the boatyard. Even businesses are closing up. Celebrations peak this weekend, but will continue through part of next week. We should probably be glad that we have any workers at all. 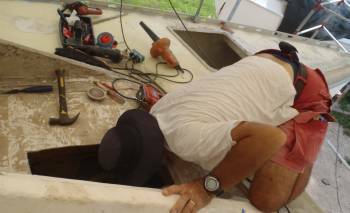 Baw spent the day working on the new outer walls going down to the transom extensions. 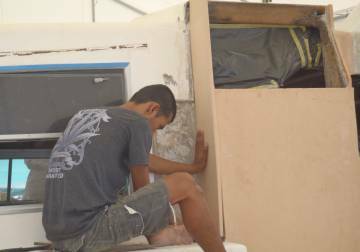 Working on starboard side, he and Houa built a wooden rail to show where the inside of the wall was to go, and then Baw started trimming up rectangles of foam to form the frames inside the wall. Then he used strips of semi‑rigid plastic held together with super‑glue to make a portable outline of the inner wall. 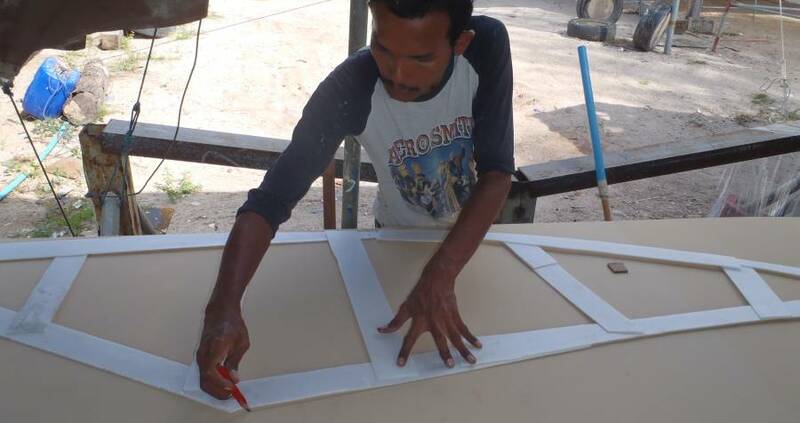 With this outline he was able to cut a sheet of foam to get very close to the size and shape needed for that inner wall. Finally, he duplicated all the small bits of foam he'd cut, making mirror images that should fit in the port‑side wall. 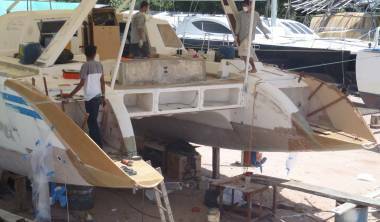 Houa was working on the port‑side extension, designing the new steps down from the deck. The Thais believe that you should always have an odd number of steps in any stairway; and that an even number of steps is bad luck! So it looks like we're getting 3 relatively shallow steps. It should be a great improvement over the 2 small vertical steps that we had before. So we now have lines where those new steps will go. Max continued his work up at the helm area, trimming up another 2 pieces of foam to epoxy in. Again he had to build supports for the flimsy fiberglass so we can push the foam against it. In the afternoon he got the fiberglass pieces cut, so he will be ready to epoxy the new foam in place tomorrow. The day started normally enough. Max epoxied in the last 3 sheets of foam around the helm area. An area under the helm still has to have the balsa removed, but we now have foam in all the areas around the helm and entryway that have already had the balsa removed. 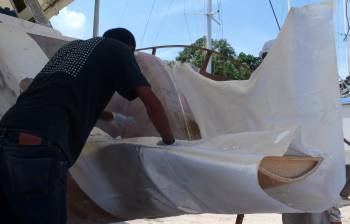 Since these were all vertical sheets, Max had to come up with creative ways to push the foam into the underlying fiberglass. His efforts have a certain Rube Goldberg look to them, but they get the job done. He also glassed in an area between the helm and the entryway. Always nice to see this sort of progress. Jon took the opportunity to dig some of the foam out of where the steering gear goes, directly in front of the steering wheel. The steering gear bolts onto one of the foam panels that Max put in recently, so Jon cleared the foam from around where the bolts will go, so they can be filled with epoxy mud before the final glass layers go on. Baw and Lek were working on the walls on the outsides of our transom extensions. All the foam for both sides of both walls, as well as the interior supports, got cut and trimmed down to size. We decided that we liked the shape of the outer wall on port side, as it doesn't flare out so much at the top. So they fitted everything on port side, then started gluing and screwing supports to starboard side, to pull it in slightly to match port side. An interesting exercise. Unfortunately, Golf was spraying another boat nearby for much of the afternoon, so we didn't get much of an explanation of how it will all go together. But apparently, when they get both walls where they want them, they'll fix them in place with epoxy mud, and then reach down inside the walls to fiberglass them. Seems a difficult way to go about it, as parts of wall are quite deep and difficult to get to with a sheet of fiberglass. We shall see. We also had a couple of guys cleaning and polishing our forebeam, getting it ready to paint. Jon had to warn Golf that we still want some welding done on our forebeam, so some of the work may have to be redone. We want to weld a tang onto the front of the forebeam so we can fit a "prod" (short boom, 3‑6' or 1‑2m long) if we want. Many of our friends have raved about the performance of their "screecher" sails, so we'd like to allow for the possibility of fitting one in the future. We'd need to have a "prod" sticking forward from our forebeam. It will need to be held down with cables (or spectra ropes) to strong pad‑eyes on the insides of our bows, down by the waterline. The level of effort is minimal and now's the time to do the work if we're going to do it. The excitement came at 3:40 this afternoon, when Ocelot started shaking. She always moves a bit as guys climb on and off her, but this went on for a couple of minutes. Soon we got reports that there had been a 8.9 earthquake off Sumatra (later downgraded to 8.6, which is still a very respectable earthquake). The phones were soon jammed and useless, so Jon grabbed a scooter to get to the internet connection at our apartment. There he was able to Skype our tsunami expert in the US, waking him up (it was 2am for him). Bruce did some quick research and soon called us back. The epicenter was off the north end of Sumatra, almost exactly where the 2004 Boxing Day quake was that did so much damage all across the Indian Ocean, including Thailand. Tsunamis can travel very fast, and the epicenter was only about 500 miles away. The boatyard, of course, is right on the water, and had been hit by the 2004 tsunami. 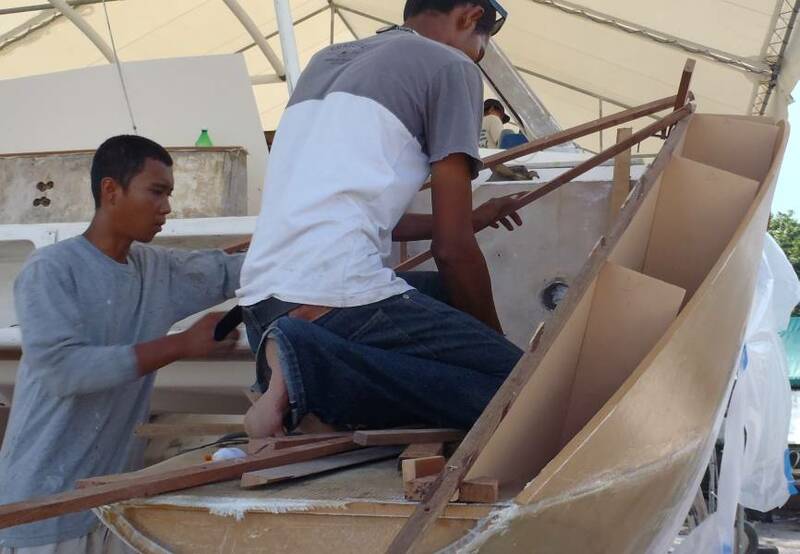 So Jon raced back to the boatyard ready to tell our workers to go home. But Thailand is very connected now, and the Tsuanami Watch loudspeakers in the little village of Kotanod by the boatyard had been blaring out the evacuation instructions within minutes of the quake. Sue was preparing to leave with Golf, but at the last minute was squeezed on the back of a scooter with Baw and Lek, who took her to the apartment. They passed Jon on the way, and he got a ride with Golf and Mai. The only people left in the boatyard were some Austrians who chose to stay on their boat. Safety was top priority on everyone's mind, but a lot of us were looking at our boats hoping they wouldn't get wrecked. Back at our apartment, Bruce called us again with more info. This quake was more of a horizontal shift rather than a vertical one, and horizontal quakes rarely generate big tsunamis. Bruce was a bit concerned that we'd felt the quake when it was so far away. The 2004 quake caused such a large tsunami because of a "zipper effect" that ripped the ocean floor all the way up to the Andaman Islands, almost 1,000 miles to the NNW, and he worried that perhaps this quake might have a similar effect. But although we've felt aftershocks, there's no indication of much of a tsunami, even though some of the aftershocks are also quite strong. Our cruising friends have mostly moved their boats out into deeper water and will probably have a rather sleepless night (as we did with a tsunami scare we got in the Seychelles in 2007) but we're cautiously optimistic that everything will be OK. Calm afternoon at our lunch spot. No tsunami. Our plans to join cruising friends for dinner at a nice ocean‑side restaurant were ... postponed. Phuket is definitely gearing up for Songkram, the Thai New Year. Many shops are closed, so our daily walk to the boatyard is now quieter than normal. It's even a bit tough to find the barbequed or fried chicken we like to buy from motorcycle vendors on the way. Golf was smart and last week ordered a lot of supplies he knew we'd need for this week and next so we wouldn't be caught out by closed shops. The exciting work today was mudding in both of the outer walls leading down to our extensions. Baw and Lek have been playing with the foam for several days now, trimming it to fit and pulling it this way and that so both sides look the same. Today they (and we) were satisfied, so they carefully put nice epoxy mud fillets in all the interior corners, effectively locking both walls in place. The next step will be glassing the interiors. We remarked to Golf that if he does more transoms like ours, it might work better to put the a skin of fiberglass on the side of the foam that ends up on the inside of the wall (on both the exterior and interior walls). This would avoid the challenge that the guys will have now to place glass down in the small spaces between the frames. But they have long, slim arms, so we figure they'll do just fine. In the morning, Max was up in the cockpit with the sander, smoothing down the fringe on the fiberglass he put on yesterday. When there's fiberglass dust flying we stay far away. Jon visited other boats in the yard while Sue borrowed Graeme's folding bicycle to zip up to the coffee shop for an iced latte, then returned to sit under a neighboring catamaran, reading her 4th novel of the week. Life at the boatyard isn't ALL work. The challenge is dealing with the baking heat. The excitement of the afternoon was the deployment of Golf's new bright yellow ventilator and its long slinky yellow caterpillar exhaust tunnel. Max set it up then donned full white suit and booties and climbed down into the battery compartment under the helm. 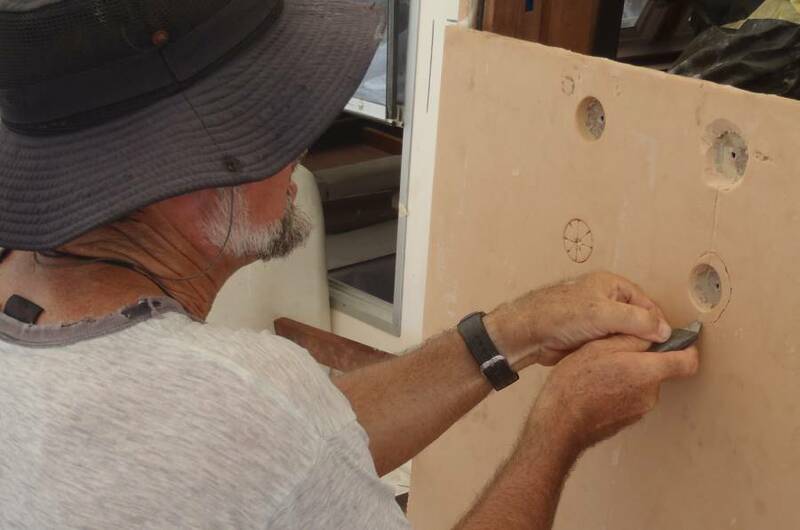 His project was to find and cut out what we hope is the last of the wet balsa core from the wall between the galley and the battery/steering compartment (which also houses the inverter, autopilot, 3 charging regulators, fridge compressor, etc, all mounted on that wall). It was a noisy, fiberglass-dusty, sweaty job, but it didn't take long. There wasn't as much bad balsa as we'd feared, but it's in a different shape than we thought, so we'll have to cut a bit more glass away to be sure we get it all before re-coring with new foam. Unfortunately, this means Jon will have to dismount (and later, remount) the autopilot and steering gear, but it will be nice to finally end the deconstruction. We met our friends Robyn and Rick on Endangered Species for dinner at Kan Eang, a beautiful outdoor restaurant right on the water at the pier in Ao Chalong. It's a great ambiance, especially at high tide! Tomorrow is Songkran and for the first time in a long time there will be no workers at the boat. We hope to join Golf and Mai for a bit of water throwing in Patong. Water sprayed everywhere along the roadside! "Suk san wan songkran!" Happy Songkran Day! Happy Thai New Year! Today was a national holiday, and in most of Thailand this holiday began yesterday and will go through the weekend. Here in Phuket everything was closed down except for a few restaurants and fresh veggie markets. 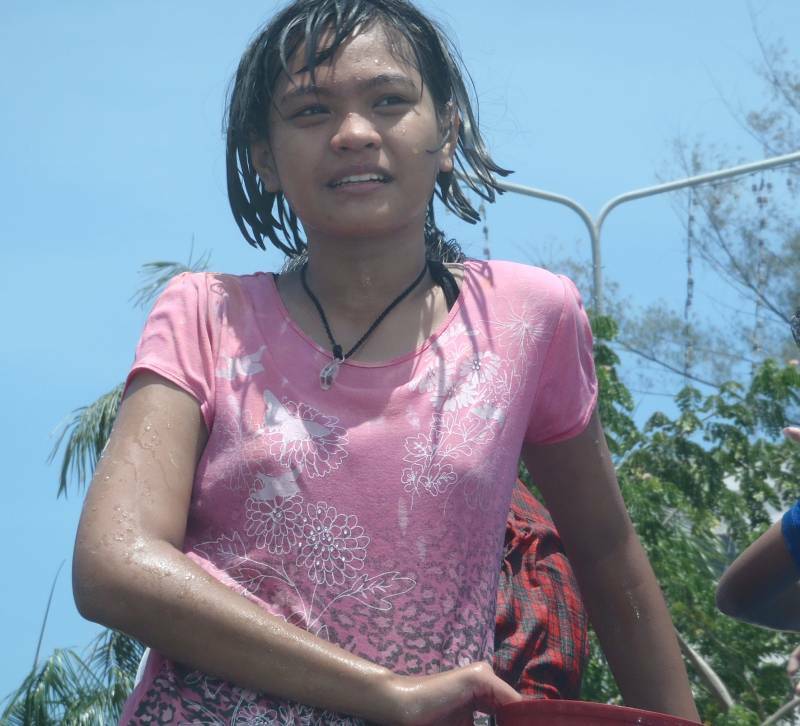 A young, cute, wet Songkran participant! Traditionally this holiday is a time of visiting family, elders, and monks, praying at the wat, and cleansing oneself for the new year. As with many celebrations, one aspect has burgeoned all out of proportion: in this case, the cleansing. Today was a day of water play throughout all of Thailand, a day when anyone and everyone is a target of water thrown by the bowlful, squirted out of a garden hose, or blasted from a big plastic pump action water gun. There is much childlike playfulness in all of this, the down side being the high accident rate on the roads. Golf explained that this week is also known as "Dangerous 7", for the 7 days of festivities in the northern cities, and the fact that there is much drinking and driving, and many accidents are caused by motor scooter drivers being temporarily blinded by water thrown in their faces. We were relieved to see no accidents on our outing. Golf and Mai came by the apartment to pick us up for a day of Songkran adventure, but unfortunately Jon has come down with a head cold and needed to lay low. In Golf's big blue music truck we cruised the main street from Ao Chalong into Phuket Town, enjoying watching the antics of hundreds of people dousing each other with water. Traffic slowed to a crawl as we approached Saphan Hin, the big port area of Phuket which is used for large events. Families gathered on the sidewalk with drums of water and canisters of powdered dye to toss on the passing motorcyclists and passengers in the back of pickup trucks. There was much laughing and gaiety as the passengers shot back or dipped their own bowls into the drums they carried in the back of the open vehicles. Golf and Mai treated Sue to a fantastic seafood lunch at Plylaem Seafood Restaurant south of Phuket town. The setting was quiet and serene, right by the water. A nice change from the craziness of Songkram in the streets. The plan for the day was to play spectators, staying dry in the truck until later in the afternoon so we wouldn't be driving for hours all wet. After lunch we slowed near a group of revelers, rolled down the windows and received a short blast of water from a family by the road who then reached in the open windows and dabbed our faces with mentholated talcum powder. 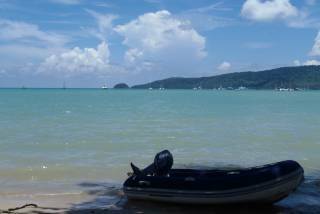 We drove to northwestern Phuket Island, through the green hills and down to the sparkling blue Andaman Sea at the gracefully curving beach of Kamala. From there the traffic increased until we were forced to a crawl through the back streets of Patong, the primary tourist town on Phuket island. In Phuket Town the majority of Songkran participants had been Thai, but in Patong the majority were "farangi", or foreigners. We all found the antics of the sunburned, goofy, water‑pistol‑crazy tourists quiet amusing! In Kata, the next town south, we stopped at a "Seven" (7/11) for afternoon iced coffee and all got blasted with water. It wasn't until we were almost back in Ao Chalong that Golf admitted that each year he drives his family around in the truck, and that they, like him, do not like getting wet, so they mostly ride inside! Even without the soaking it was a great day! As for Ocelot, she is awaiting the end of Songkran and the return of the workers. It is possible that we will have no workers there tomorrow, certainly not Max and Lek who have gone home for the long weekend to be with their family. Golf said that perhaps Houa will be there working on Ocelot, in which case he will call us and we'll wander on down to the yard. Wishing everyone a happy and blessed New Year! We figure one never has too many good wishes for a new beginning!